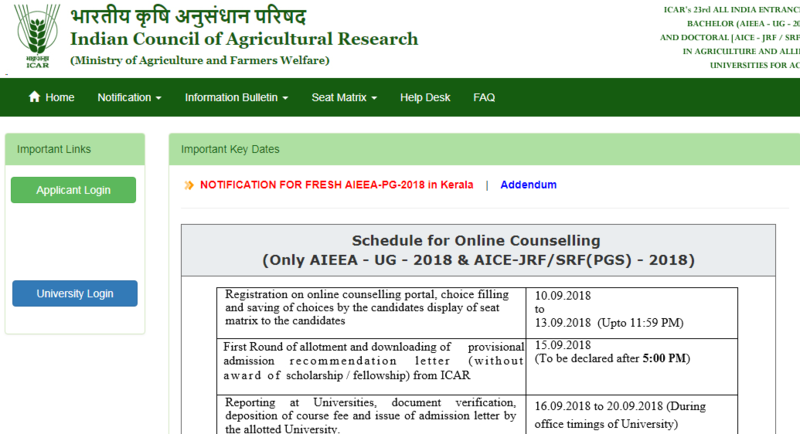 ICAR Cut Off 2018: UG, PG Expected Cut Off Marks Online – In short, Indian Council of Agriculture Research or ICAR Cut Off percentage is 50% for General category candidates and 40% for Scheduled Caste/ Scheduled Tribe and Physically Challenged candidates. ICAR Cut Off Marks or Cut off percentages can mainly be divided into three sections i.e. 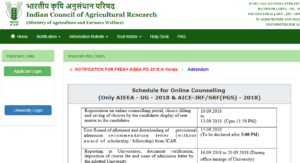 ICAR (Indian Council of Agricultural Research) Admission Cut Off, ICAR Qualifying Cut Off and ICAR Eligibility Cut Off Marks. Keeping ICAR recently released schedule and important dates in mind, 19th August 2018 is the ICAR Re-Exam date for Under Graduation, 18th August 2018 is ICAR re-exam date for Post Graduation, 7 September 2018 was ICAR Cut Off and Result in declaration date and 10th September 2018 is the date from which ICAR Counselling is commenced. Apart from this, most important is to learn about ICAR Cut Off University wise. ICAR Score and Cut Off Rank required to get admission into Banaras Hindu University are respectively, 512 and 346 for General, 486 and 686 for Other Backward Class, 419 and 2633 for Scheduled Caste candidates and 382 and 4525 for Scheduled Tribe candidates.